All the official events of the DMD like the Opening on Wednesday and the "Honda-Deauville-Night" on Friday take place in the middle of the old town of Eberbach. 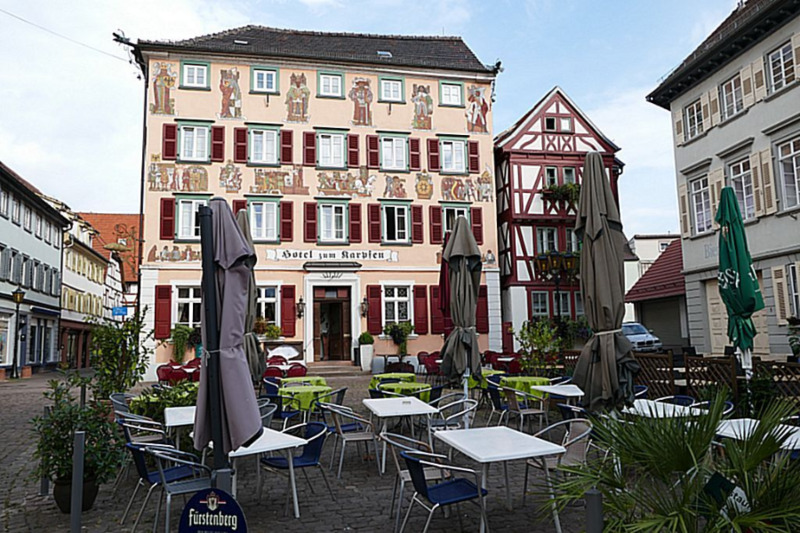 Meeting point in the evening is the "Old Market (Alter markt)" in Eberbach, the historic market place directly in front of the DMD-hotel "Karpfen". In bad weather it will be possible to get together inside the hotel and the surrounding inns. The "Karpfen" will offer a small "DMD Card" with discounted rates at night. Further information on the evening program can be found on the linked site. You will find the info-desk also in the hotel "Karpfen". The info-desk will be open during the whole of the meeting. Here you will be registered and you will get everything you need for the meeting, including information and assistance (we hope) for every problem. 7:30 p.m. short, guided tour, finishing at the Town Hall. Starting point: in front of the DmD-hotel "Karpfen"
Starting Time 8:30 - 11:00 a.m.
Farewell at the DMD-hotel "Karpfen"